No sewing projects to show this time, because I'm not working on anything new at the moment. Lately I've been hand quilting on and off for a quilt I've already shown in a previous post, and I've been busy knitting socks as well. 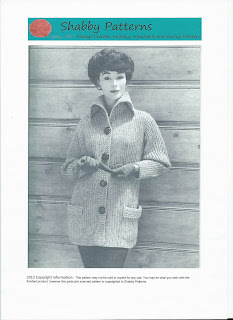 But as I don't want to stop blogging I thought I'd show you some gorgeous knitting patterns that I found on Etsy.com. 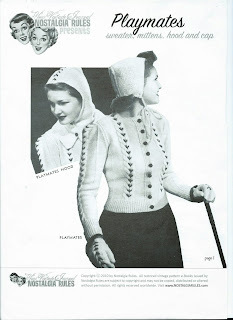 Granted they're knitting patterns, but they're vintage so at least they're somewhat related to the focus of my blog. The stitches are pretty straightforward: twisted ribbing, knit and purl, and a simple cable. The challenge lies in accomplishing a good fit. The instructions provide a list of measurements you need to take to determine your size. I'm sure my sister will be happy to assist me taking them. In that respect I find sewing garments easier. My preferred method to make clothes is tacking the entire garment and put it on. Any fitting issue becomes apparent instantly and can be dealt with right away. 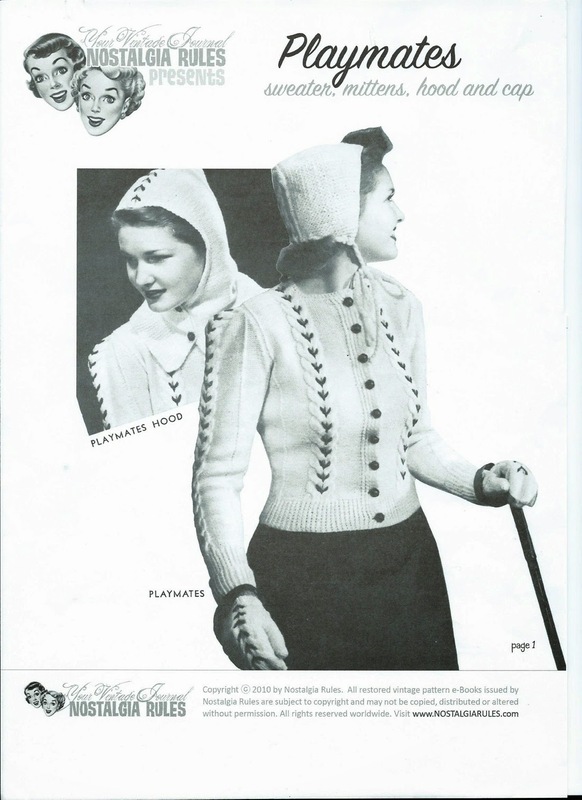 So, because the lovely fifties cardigan will be challenging, I treated myself to an easier to make cardigan as well. 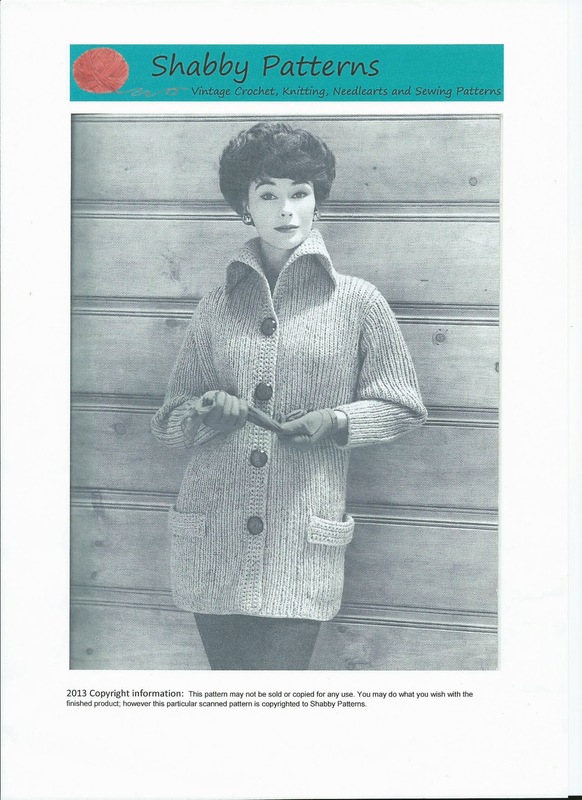 This one is called a 'Car coat' and was published in 1960, which is the year I was born. I'm going to make this cardigan first, because I don't foresee any fitting problems. Of course I don't want to end up with a too over sized cardigan, but if the finished size is slightly bigger or smaller it wouldn't be that big of a deal really. The cardigan is knitted in ribbing stitch entirely, combined with some crochet ribbing. In Holland the most common way to knit is to tuck one needle under your right arm, and to hold the yarn in your right hand. So you can imagine what it was like for me when I decided to knit socks. The only sock needles on the market are 7"! You can't tuck those under your arm, so what was I to do? Well, I found the answer on a website called KnittingHelp. I had to learn what they refer to as the 'Continental method'. I believe it's quite common in the UK. Anyway, you hold the needles in your hands and you hold the yarn in your left hand. It took me 7 weeks to master, but it was definitely worth the trouble, especially when you need to alternate between purl and knit stitches a lot.